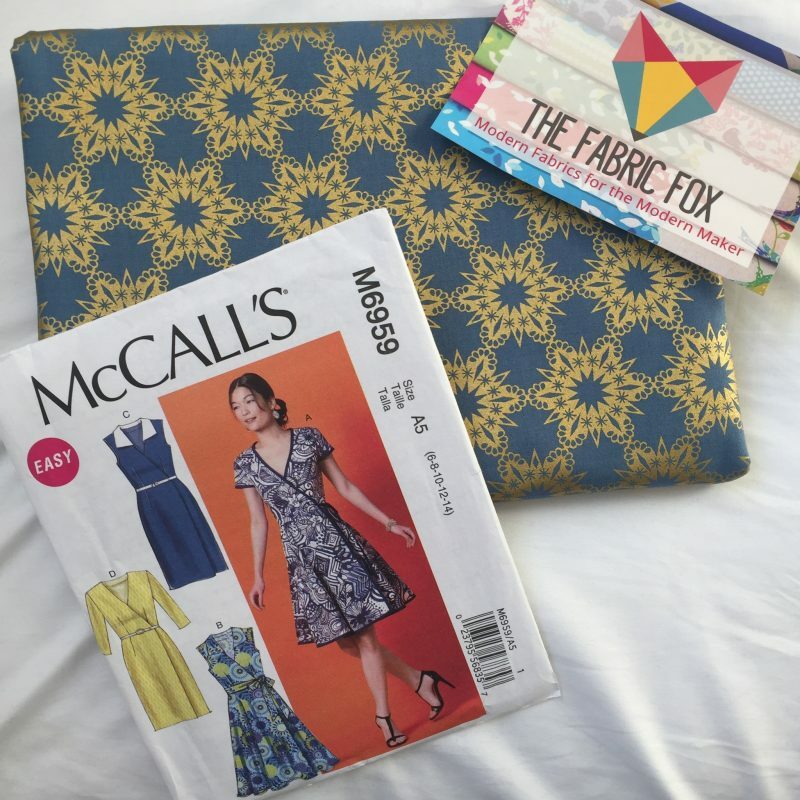 Despite the fact that it’s been a bit quiet over here on the blog this month, I’ve actually managed to get some sewing done. Yay, happy dance! Of course, me being me it’s not actually anything from my planned capsule wardrobe. I’ve been distracted by the Christmas season and my need for a new dress. For the first time in years, I actually have a couple of Christmas things to go to. I’ve got a party with my karate club and a coffee morning with my networking group. Check me out! Ethically, I did have a bit of a to and fro as to whether I should make something new. I figured that if I made something not too Christmassy then I would definitely hit #30wears. I won’t lie, it’s hard to slow down and really consider what I’m making when a large part of me is screaming “ooh new party dress”. Rather than go for my beloved Cambie dress again, I wanted to sew something new. Hello McCalls 6959. I bought this pattern a couple of years ago because I loved View B but I’ve never gotten around to it. I thought it would make a pretty good party dress that I could also dress down a little with a jumper over it or a long sleeve top underneath. 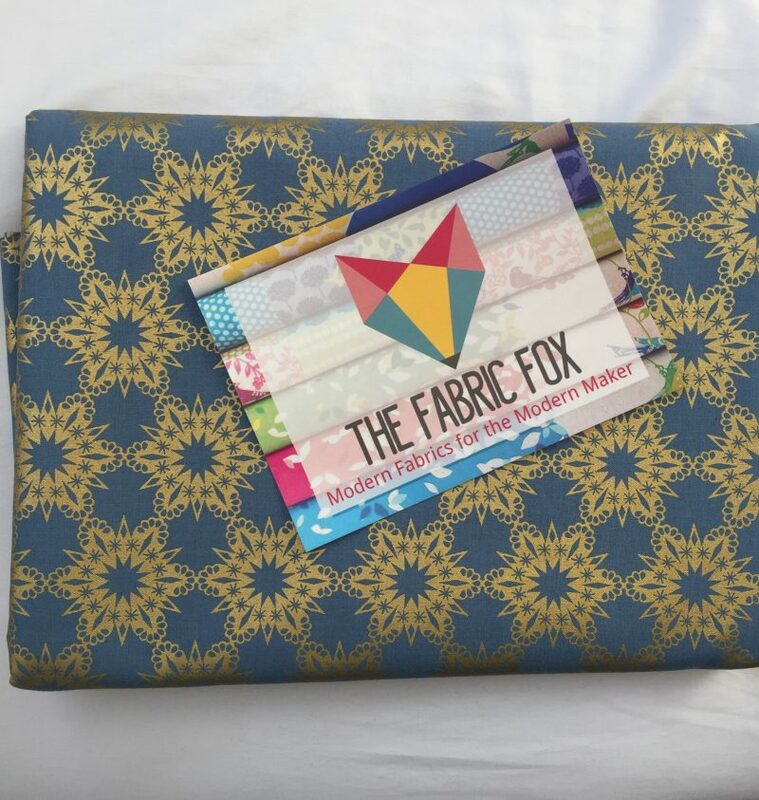 It was kismet that Kirsty from The Fabric Fox got in touch with me after I’d decided what I was making. I met Kirsty back in June at Blogtacular and we had a great time hanging out drinking unicorn smoothies. 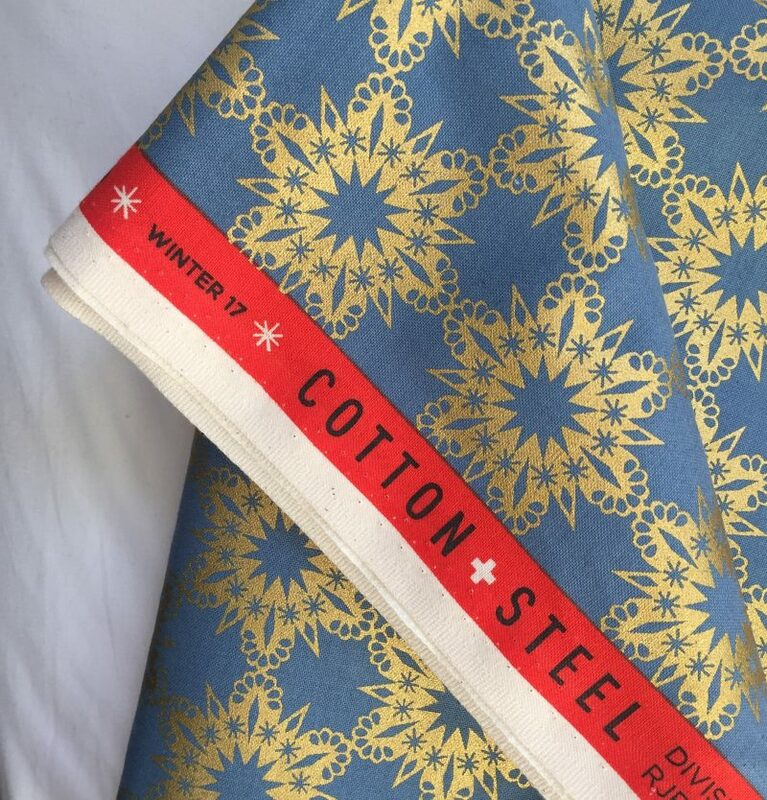 Kirsty very kindly offered to send me 3m and I chose some beautiful Cotton + Steel fabric. I thought the snowflake pattern was more winter than Christmas meaning I could wear it more. Result! The gold snowflakes actually are metallic and look so pretty in real life. Interestingly this fabric is unbleached. Most fabric is bleached before the patterns are printed onto it, so I like that this is a bit more of an eco-friendly choice. As I said, I love View B of this pattern, it’s the collar that really catches my eye so I definitely wanted to sew this version. I’d rather have sleeves so I decided to add the sleeves from View A. When I bought this pattern, I wasn’t really aware that sewing pattern sizes are different from High Street dress sizes. This pattern goes up to McCalls size 14, so when I bought it I figured it would match up with a commercial size 14. I was a bit worried when I measured myself and fell between a 16 and 18, I don’t think I quite have the skills to draft the pattern larger! Usually I would avoid sewing a muslin like the plague because I’m fairly lazy, but as I really wasn’t sure about sizing, I had to. 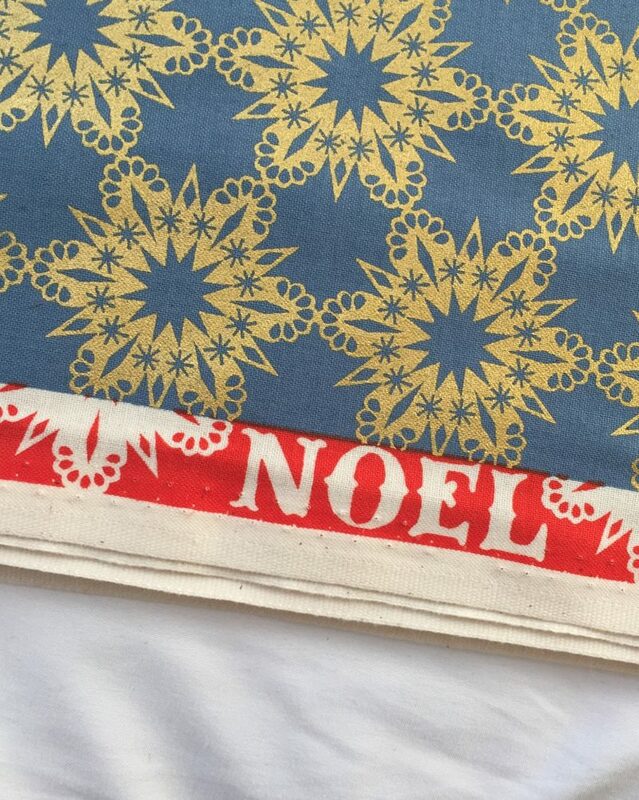 I couldn’t risk wasting my beautiful new fabric! As it’s a wrap dress, I’ve assumed that if the bodice fits, then the skirt will. So I only made a muslin of the bodice. Thankfully the size 14 appears to fit ok with no real adjustments needed. For reference I fall between a size 12 and 14 in High Street sizes. With some trepidation I decided to go ahead and make the size 14. Following the suggested cutting layout went out of the window in about 5 seconds, when I realised I couldn’t fit all of the pieces on. I checked the pattern envelope again and realised that I needed more than 3m for my size and View. I seem to have a real inability to read pattern envelopes *face palm emoji*. With some help from Andy, I managed to make it work. I eventually fit all of the pieces on, including the sleeves. Well, except for the belt… I’ve also had to use a different fabric for the facings, but obviously that won’t change anything. After getting pretty annoyed with myself and generally muttering under my breath for a while, I decided to ditch the belt. 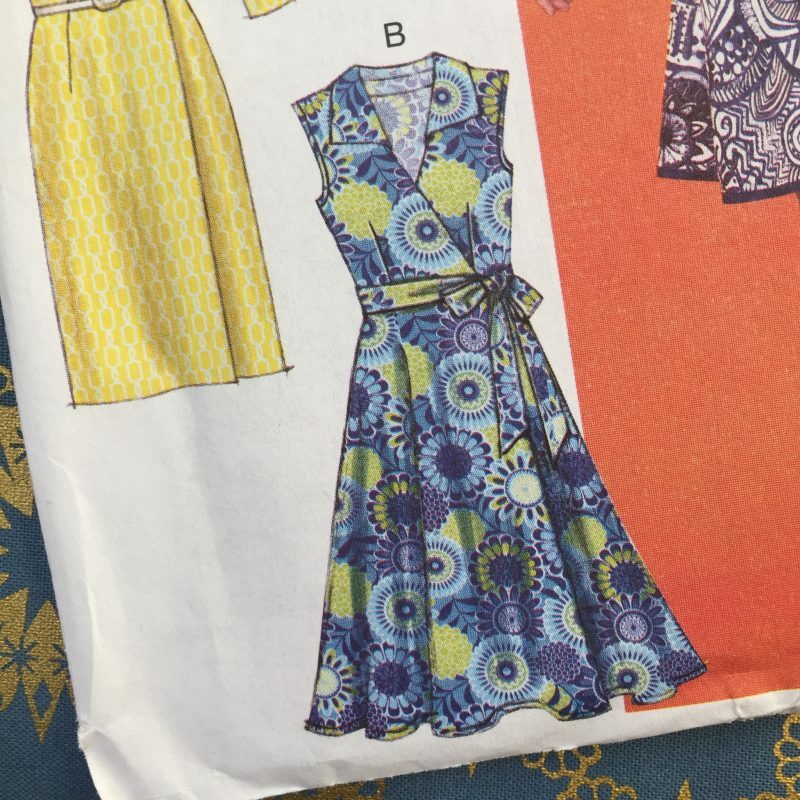 So, now my dress will be a mash up of View A and B. I need that collar, but I don’t want the bias binding trim all the way around (it reminds me of a hospital gown). I’ll just attach some bias binding for the closure (adding a hook and eye for security!). After cutting all the pieces out, I was left with a fair bit of fabric in all kinds of odd shapes and sizes. It was too pretty to waste so I decided to make some bias binding out of it. Plus that means my bias binding closure will match the rest of the dress which makes me happy. I’ve never made my own bias binding before. I did cut a load of scrap fabric into strips once, but I’m used them for my rag rug which is still in progress. Surprisingly, it basically took me a day to do, sewing all of the strips together seemed to take forever. Totally worth it though because it’s so pretty! I’m going to use it on this dress but there’ll also be enough left to use on other projects too. It’ll look pretty awesome as piping on something I think. So far, I’m happy with my progress on this dress. Any problems I’ve had have definitely been of my own making! My aim is to get it finished but the end of the weekend. Having read the instructions, it shouldn’t take long but I’m trying to squeeze in sewing around so many other things. 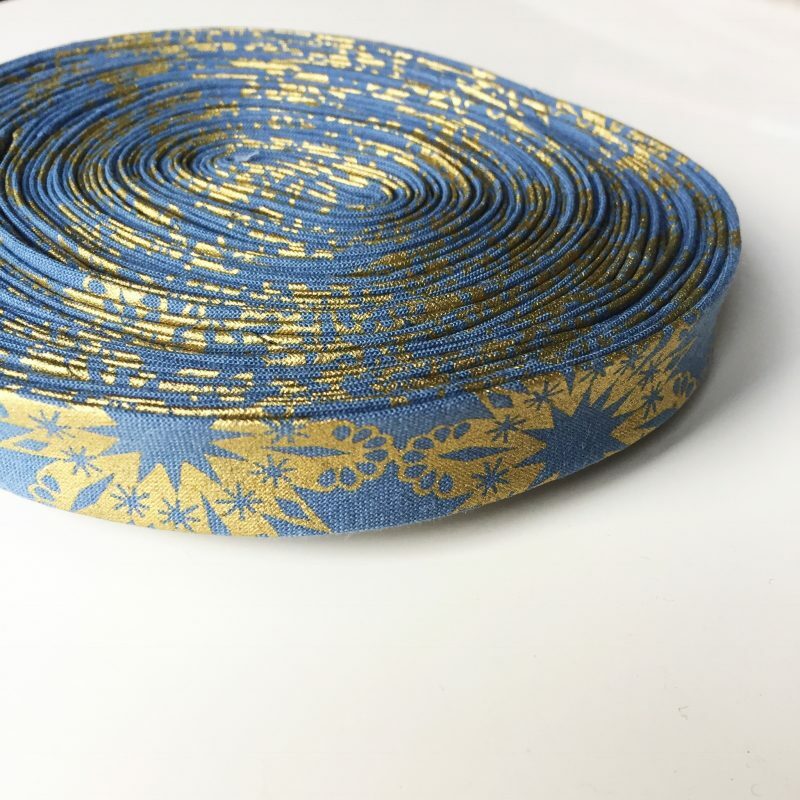 I almost forgot, how pretty is the selvedge? I’m using part of it to make a decorative label on the back facing. I like little details like that.